An aspirin a day could dramatically cut people's chances of getting and dying from common cancers, according to the most detailed review yet of the cheap drug's ability to stem disease. More than 130,000 deaths would be avoided over a 20-year period if Britain's 50- to 64-year-olds took a daily aspirin for 10 years, because the beneficial effects continue even when the aspirin is stopped, the authors say. Cuzick said that taking aspirin "looks to be the most important thing we can do to reduce cancer after stopping smoking and reducing obesity, and will probably be much easier to implement". In a briefing to journalists, the scientist added that he had been dosing himself for the last four years, keeping the tablets beside his bed. "I take aspirin as part of a bedtime ritual every day and I can achieve that quite easily," he said. Aspirin: effects on cancer Aspirin was originally developed as a painkiller and treatment for fever and inflammation, but more than a century after it was first synthesised from willow bark, researchers have found more medical uses for it. It has been demonstrated to reduce the risks of heart attacks and strokes as well as the chances of some cancers. But the big question has been whether the benefits outweigh the harms, because aspirin can cause stomach bleeds, which could be potentially fatal in some people. Concluding that the benefits outweighed the risks, Cuzick's team, writing in the cancer journal Annals of Oncology, said that by taking low-dose aspirin every day for 10 years, bowel cancer cases could be cut by about 35% and deaths by 40%. 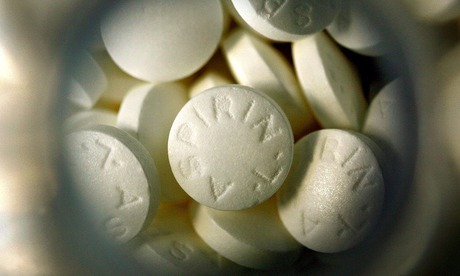 Aspirin could reduce rates of oesophageal and stomach cancers by 30% and deaths from them by 35% to 50%. However, taking aspirin every day for 10 years increases the risk of stomach bleeds among 60-year-olds from 2.2% to 3.6%. In about 5% of those who have a stomach bleed, it could be fatal. Cuzick added that there was evidence that this side-effect could be more common in people who have the bacterium Helicobacter pylori in their stomach, which also causes peptic ulcers. He said people considering embarking on a regime of daily aspirin should talk to their GP and it might be possible to be tested first. A second risk is stroke. Aspirin is already given to some people to reduce their risk of heart attacks or ischemic stroke, caused by blood clots, which it does by thinning the blood. But it is likely to worsen a haemorrhagic stroke, caused by bleeding in the brain. The study also shows that 10 years of aspirin reduces heart attacks by 18% and deaths by 5%, but although it reduces stroke numbers by 5%, there is a 21% increase in deaths. All the cancers in which aspirin has a beneficial effect have some lifestyle causes – from smoking in lung cancer to alcohol in oesophageal cancer and obesity in all of them. 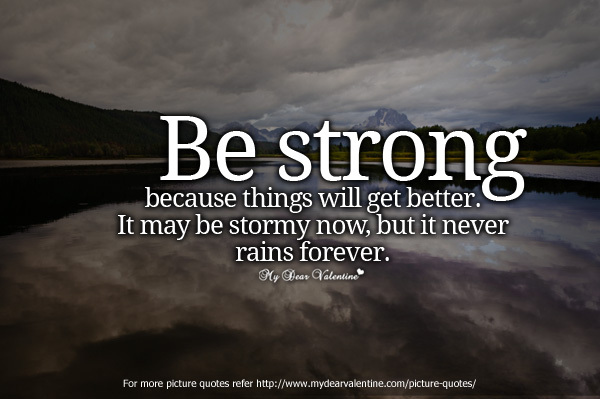 Taking aspirin, said Cuzick, "should not be seen as a reason for not improving your lifestyle". The drug, however, would reduce the cancer risk even in people who have a healthy lifestyle, he said. Increasing numbers of people in middle age are already being prescribed cholesterol-lowering statins to reduce their risk of heart attacks and strokes. Recently there has been an outcry over the "medicalisation" of the population and concern about side-effects – which trial data suggest are less common and less serious than those in aspirin. Cuzick said there was no evidence of any interaction between the two drugs. "In many people, taking both of them is probably a good idea," he said. However, Cancer Research UK (CRUK)warned that people should speak to their GP before starting on daily aspirin. The charity said it would like to see more research on who should and should not be taking it. "Aspirin is showing promise in preventing certain types of cancer, but it's vital that we balance this with the complications it can cause – such as bleeding, stomach ulcers, or even strokes in some people," said Dr Julie Sharp, head of health information at CRUK. "Before aspirin can be recommended for cancer prevention some important questions need to be answered, including what is the best dose and how long people should take it for. And tests need to be developed to predict who is likely to have side-effects. "Given the continued uncertainty over who should take aspirin, Cancer Research UK is funding a number of trials and research projects to make the picture clearer," she said. Aspirin also has a smaller preventive effect on other major cancers, according to the research paper. It could reduce the number of lung cancers by 5% and deaths by 15%. It could cut prostate cancers by 10% and deaths by 15%, and breast cancers by 10%, with a reduction in deaths of 5%. There would be an overall 9% reduction in the number of cancers, strokes and heart attacks suffered by men and a fall of 7% in women. Cuzick acknowledged that people generally did not like taking pills for a long period, although, he said, some were "more than happy to take multivitamins for many, many years without any clear evidence of benefit. It is a regular habit." As a generic drug – Bayer's patent ran out in the 1930s – there are no profits to be made by big pharmaceutical companies from the estimated 100bn tablets taken around the world every year. The risk of both developing and dying from digestive-tract cancers – those of the bowel, stomach and oesophagus – was reduced by about a third in people who took low doses of aspirin daily for 10 years. 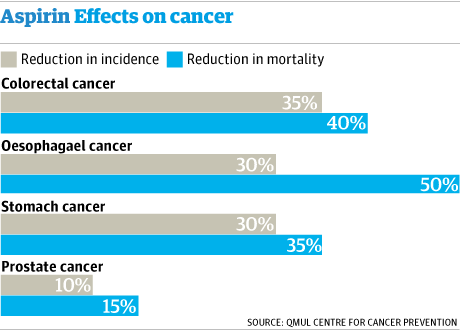 Cases of breast, prostate and lung cancer were reduced by about 10%, though no effect was seen on other cancers. For aspirin's anti-cancer benefits to kick in, people needed to have taken aspirin for at least five years from the ages of 50 to 64. Most of the research was based on low 75mg doses. The longer the drug was taken, the better its preventive effects, until the age of 65, after which there was an increased risk of internal bleeding. The study found no benefit in taking aspirin before the age of 50. Scientists recommend that people consult their GP before taking daily aspirin to prevent cancer. There are two theories. First, inflammation in the body causes cells to divide, which increases the risk of them mutating into cancerous forms. Because aspirin reduces inflammation, it lowers the risk of cancerous cells developing. Second, cancer cells can piggyback on blood platelets, which help the blood to clot. Aspirin thins the blood by making platelets less sticky, which may also make it harder for them to carry cancer cells and so spread the disease. Aspirin can cause bleeding in the stomach and bowel. This can be serious, especially in the over 70s, but rarely affects younger people unless they have an underlying condition. "My personal advice would be that everyone 50 to 64 should consider taking aspirin. You should talk to your GP first to see if you've got any of the major risk factors for bleeding, but if not I think the benefits substantially outweigh the risks," said the senior author, Prof Jack Cuzick.